The Low-Down: Is Social Media Ruining Human Memories? Is Social Media Ruining Human Memories? omehow, whenever I find myself scrolling aimlessly on my personal Instagram feed, I always end up near the end, fixated on the first photos I posted, in June 2016. I don’t know if it was the music—Rihanna, Chance, Drake, and Kanye all released life-changing albums around then—or the freedom that came with traipsing all over Europe those three months, but that summer is the last one that’s really clear in my memories. In the summer of 2016, we had fewer apparent reasons not to welcome social media into our lives with open arms. But how this embrace would go on to affect our memories, a core cognitive process, would be greater than we could have foreseen. Creating a memory begins with perception: Your brain registers visual, auditory, olfactory, and tactile sensations—like the sweet sharpness of mint ice cream or the balmy scent of magnolia on warm summer nights—and sends them to the hippocampus to determine if they’ll be stored as long-term memories. Factors like familiarity, repetition, and emotional arousal (a state of heightened physiological activity) all help determine which experiences cross the short-term to long-term memory barrier. As the neuroscientist James L. McGaugh noted in his 2013 paper “Making Lasting Memories: Remembering the Significant,” increased emotional arousal during an experience actually stimulates your amygdala (the part of your brain responsible for emotions, survival instincts, and memory) to release stress hormones—chemicals secreted in response to stressful or exciting occasions—making it more likely for those experiences to be encoded as long-term memories. 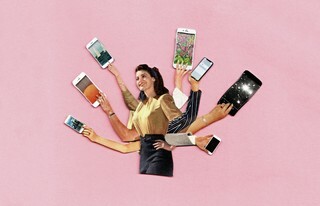 McGaugh’s research, first published in 2013, seems much more relevant now: The inextricable flow of digital technology in our lives has rendered it more difficult than ever to be emotionally connected to our experiences. In hindsight, the summer of 2016 was a crucial point in time when many tech companies were faced with an opportunity to augment social media’s influence in our daily lives. The platforms that lacked that foresight, like Vine and Tumblr, would recede into tech’s oversaturated backdrop, while those that anticipated that moment would come to dominate the landscape. Instagram, the photo-sharing platform acquired by Facebook in 2012, was simple proof of that. While Snapchat had found initial success from its vanishing messages, its “Stories” format—which lets users take candid photos and videos that last 24 hours on their feeds before disappearing—changed the game entirely after its release in 2013. Three years later, Instagram essentially stole the feature for its own platform. Although many—including me—were skeptical at first, Instagram Stories rapidly took over. Indeed, after Stories appeared, the platform saw their monthly active user base jump from 500 million users to 700 million by the following April, effectively doubling its annual user growth rate in just eight months. The Stories format broke with the static, hypercurated images typical of Instagram posts with its elusive, 24-hour narrative sequences full of “real-time” glimpses into the everyday, lending a more casual tone to the app. Brands and consumers alike benefited from the feature and continue to use it today. The downside to that is evident: Now there is a pressure to post more often and during our most exciting experiences—interrupting the moment to add a story for our followers to see. The first time I noticed myself doing that was New Year’s Eve 2016. I was at a warehouse party with some friends in LA when the countdown began; we were relishing each other’s company and happy we made it somewhere before midnight. About to pull out my phone to Snap the countdown, I changed my mind last minute and put it away, not wanting to leave the moment. But when I turned to my boyfriend, he had his own phone out, yelling “Three, two, one!” into the screen. He kissed me as everyone cheered, but I recall feeling strangely disconnected from him. Mostly, I wondered if he’d enjoyed the moment as much as I did. Julia Soares and Benjamin Storm, researchers at the University of California, Santa Cruz, have studied the influence of digital technology on memory for years. Research they released last March suggests that, when taking photos on camera phones, people disengage from the moment to capture the experience and therefore store the memory less deeply than they would otherwise. Their groundbreaking paper, “Forget in a Flash: A Further Investigation of the Photo-Taking Impairment Effect,” compared participants’ memory in three scenarios: after pure observation, documentation on the Camera app, and documentation in a condition when their photos wouldn’t be saved, like on Snapchat. Previous research had already established that a reliable memory source, such as a camera, would worsen people’s memory—a phenomenon dubbed the “photo-taking impairment effect.” Researchers, however, had largely chalked up the effect to “cognitive offloading” (when people store memories onto an external memory source instead of personally retaining them), but Soares and her team took those findings further by testing whether cognitive offloading was the sole cause of memory impairment in photo taking. Surprisingly, it was not. “You’re stepping back from the present moment, and that’s what’s causing that disengagement. You’ve literally put a screen between yourself and the event that you’re trying to record. And it seems like it would take a little bit of time to recover from that attentional disengagement, to get back in the mode of ‘OK, I’m living in the present experience. I’m being present,’” Soares elaborated. Yet as “being present” becomes increasingly part of our conversation around mindfulness, truly being able to stay disconnected from social media seems to grow more difficult with each passing year. The rapid-fire rhythm of the digital universe doesn’t let up, nor does the pressure to keep up. And while we feel the problem poignantly on a voluntary, consumer level, it’s exacerbated when we feel like we have to post against our will. I find myself constantly refreshing Twitter for the latest news updates or reassuring people I’m alive and well on my Instagram Story if I go too long without posting. Feeling the pressure to constantly produce content to share with others often devalues the time I have to myself—distracting me enough that I can’t fully emotionally appreciate every moment. Yet as “being present” becomes increasingly part of our conversation around mindfulness, truly being able to stay disconnected from social media seems to grow more difficult with each passing year. The rapid-fire rhythm of the digital universe doesn’t let up, nor does the pressure to keep up. And while we feel the problem poignantly on a voluntary, consumer level, it’s exacerbated when we feel like we have to post against our will. She loves her job, but Dix is no stranger to the negative effects social media can have on one’s psyche and self-esteem. At her first New York Fashion Week, Dix struggled to reconcile her personal obligations—which included taking care of her roommate after an accident—with her professional obligations to live-tweet a show and orchestrate a social media takeover that was constantly interrupting what she needed to do in the present. The professional photographer Aaron Ricketts prides himself on his ability to put intentionality at the forefront of his work. He aims to capture dynamic movement and eye-catching moments—like his famed shot of Offset’s first proposal to Cardi B in October 2017. As someone whose shot could make or break an assignment, Ricketts emphasizes how, when capturing a moment, he’s hyperaware of a situation and its smallest details compared with a regular observer, often entering a heightened emotional state that makes it easier for him to remember those moments. Being selective and mindful about his photography is a trait that’s proven useful in Ricketts’s own social media use. Even though he documents experiences for a living, Ricketts doesn’t feel the need to constantly keep up on social. Rather, he’s found the balance between showing the world what he’s up to and saving some of those moments to enjoy himself.